Manly Art Gallery and Museum is located in one of the most scenic areas of Manly. 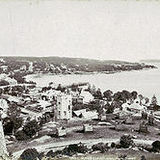 With views over Manly Cove, the Art Gallery and Museum could be mistaken for a large domestic house, rather than a regional gallery. Nonetheless, if those walking along the West Esplanade were to duck inside, they would find a selection not only of Australian papers, but also a particularly extensive collection of ceramic works. In fact, it is this ceramics collection, along with the Dattilo-Rubbo collection, that forms the centre-piece of the museum. It was Dattilo-Rubbo who was instrumental in the finding of Manly Art Gallery and Museum, and it is for this reason that the Gallery houses the largest collection of his works anywhere in the world. As for the ceramic works, the Gallery offers a visual continuum of development of distinctively Australian styles of clay work from 1945. Given the size of the collection, the Gallery rotates which pieces are given pride of place in the premises itself. Nonetheless, it is possible to view these particular works online. The Gallery also seeks to contribute to the community by hosting a variety of events. Through these events, it is possible for visitors to learn about lesser known aspects of the Australian arts scene from working artists. The Manly Art Gallery and Museum is open from Tuesday to Sunday, 10am to 5pm, and visitors are permitted to visit for free!